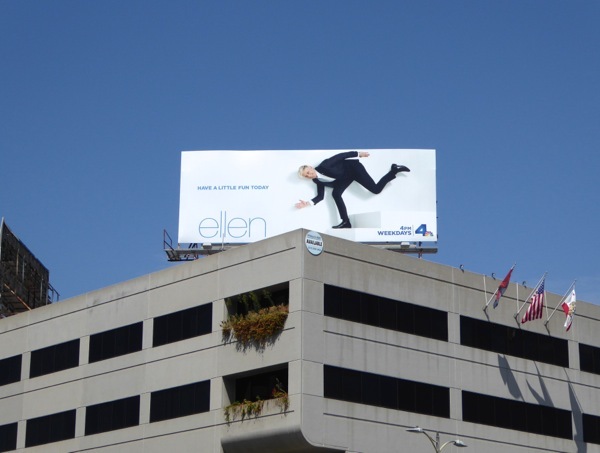 You can tell it's the start of a new Fall TV season when Ellen DeGeneres' beaming face pops up in the city skyline. 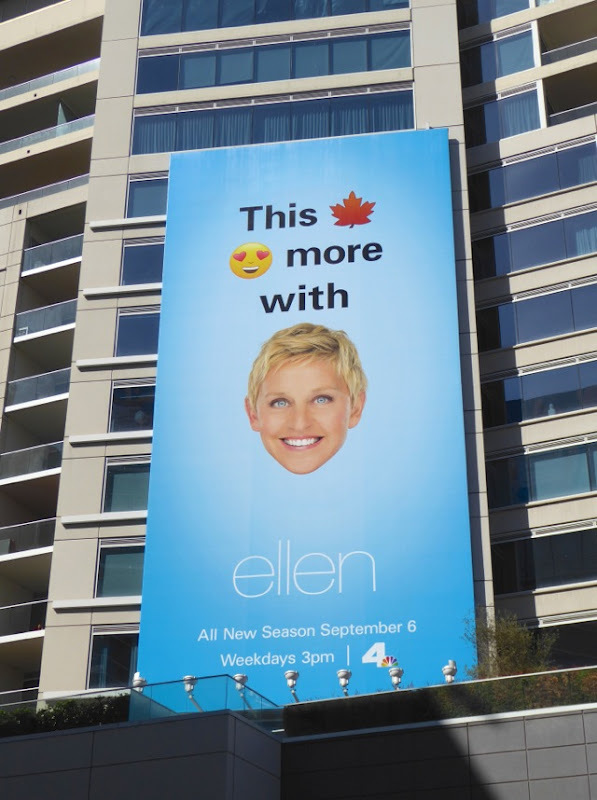 For her fourteenth season of celebrity and inspiring interviews, hilarious pranks, audience participation and dancing in the aisles, she's enlisted some emojis to get her happy message across. These rays of sunshine were snapped around the streets of L.A., including along Santa Monica Boulevard, Sunset Boulevard, Hollywood Boulevard and over at Warner Bros. Studios in Burbank where her weekday show is filmed, from September 3 to September 16, 2016. 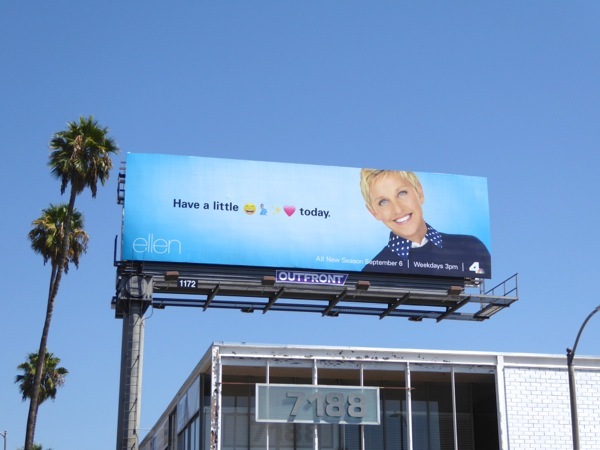 Plus for more humorous creatives using emojis, be sure to also check out this Key & Peele season five TV billboard, these refreshing Hubert's Lemonade billboards and this hilarious Deadpool movie billboard. 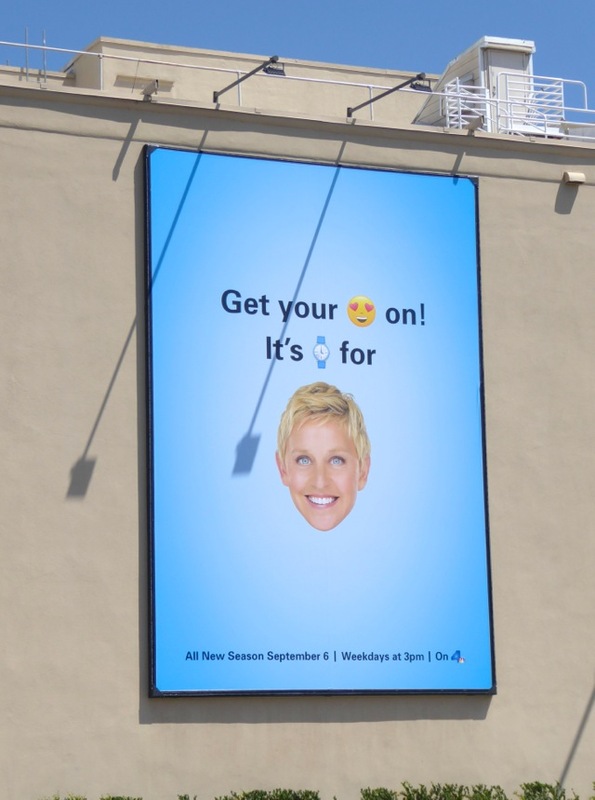 Meanwhile the Ellen show has employed the same 'Have a little fun today' tagline starting with season twelve through to the thirteen season last year. 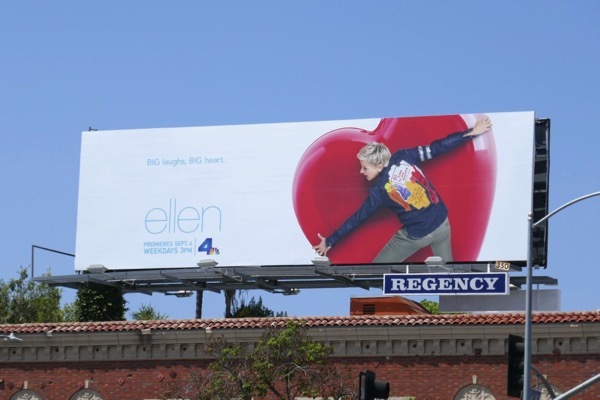 These season thirteen billboards with Ellen striking a fun pose were photographed along the busy Sunset Strip and high above San Vicente Boulevard from August 26 to September 2, 2015. 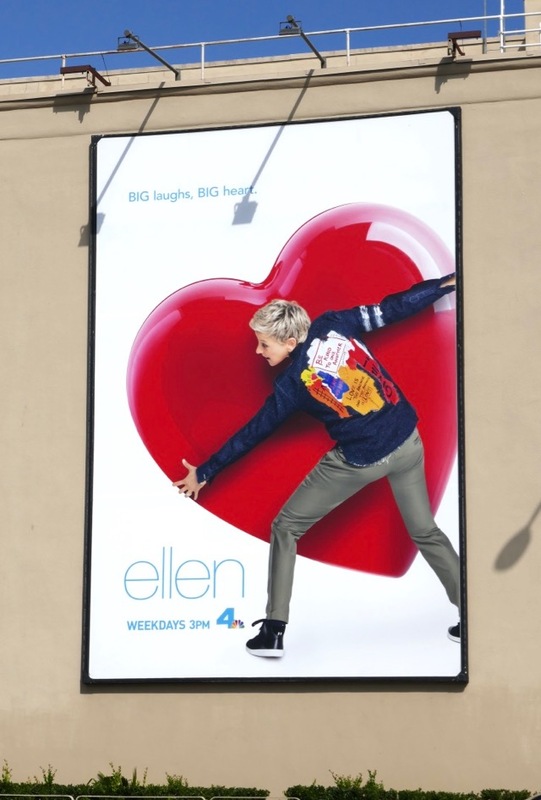 The same year Ellen was super-sized for her collaboration with Gap Kids and her ED line of clothing and accessories. 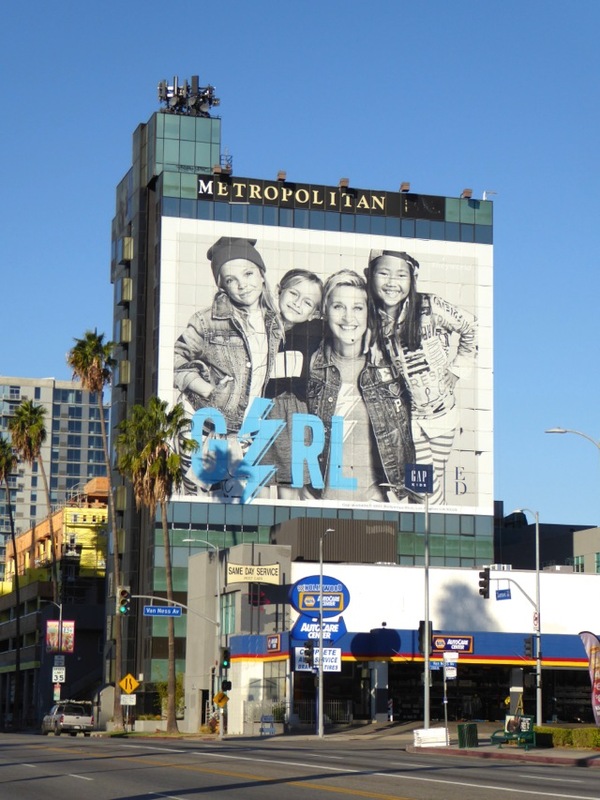 The two landscape 'Girl' billboards were snapped along Pico Boulevard on August 23, whilst the massive ad creative on the side of Hollywood's Metropolitan Hotel was photographed westbound along Sunset Boulevard on November 28, 2015. 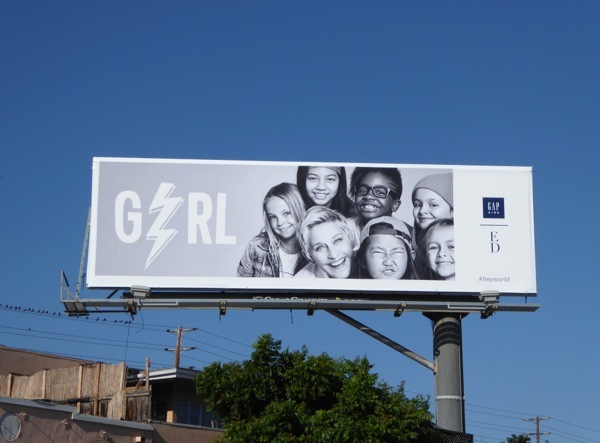 For more adorable kids fashion ads, be sure to also enjoy these Diane Von Furstenberg Gap Kids billboards from 2013. 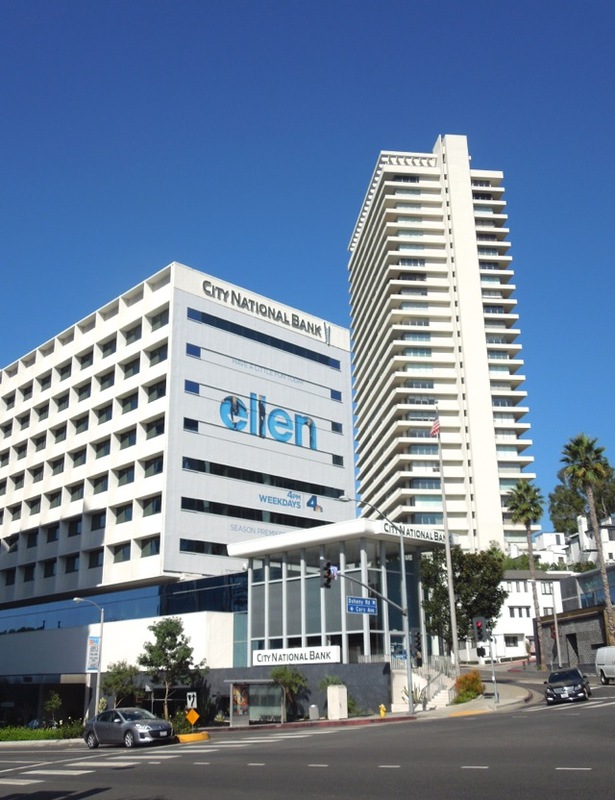 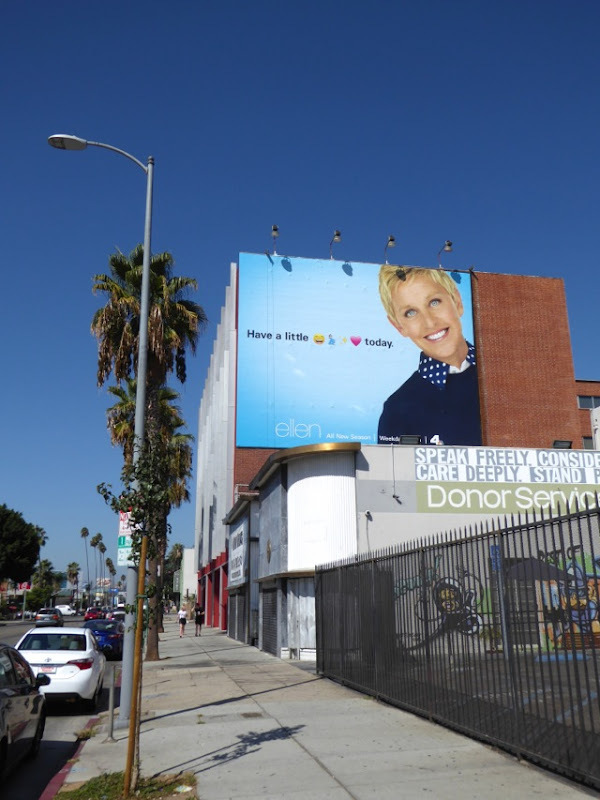 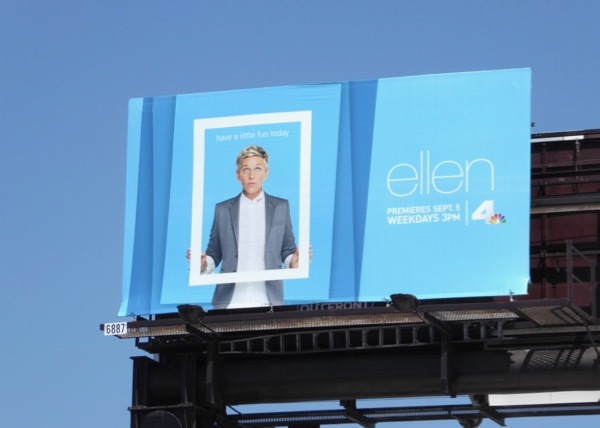 Meanwhile these season twelve billboards for Ellen were snapped along Melrose Avenue and Sunset Boulevard from August 27 to September 6, 2014, including the giant-sized version at the start of the Sunset Strip in West Hollywood. 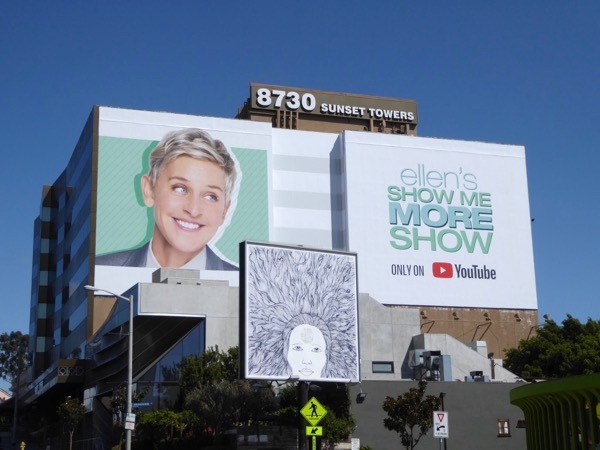 Fans of the daytime talk show host, voice of 'Dory' and former sitcom star, can also check out these previous season Ellen TV billboards and Ellen's Oscars billboard for when she hosted the 86th Academy Awards in 2014. 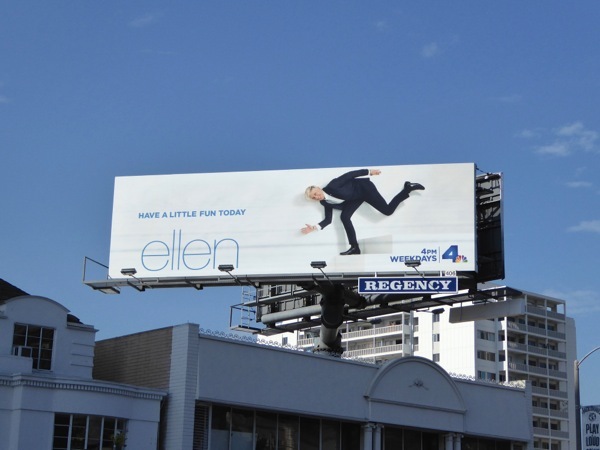 Hopefully these joyful Ellen billboards will help put a little spring in your step today. 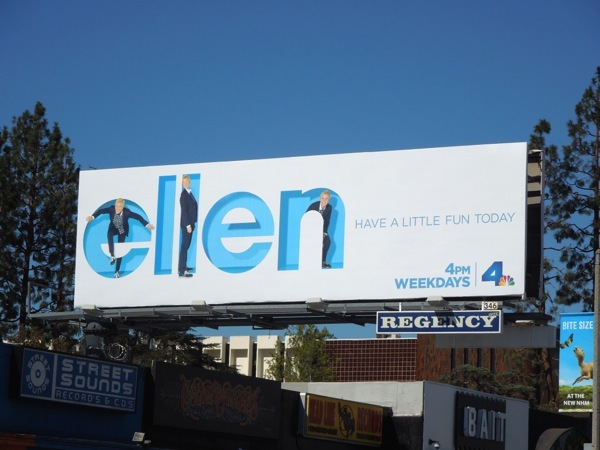 Wishing you all a fun-filled weekend whatever you get up to. 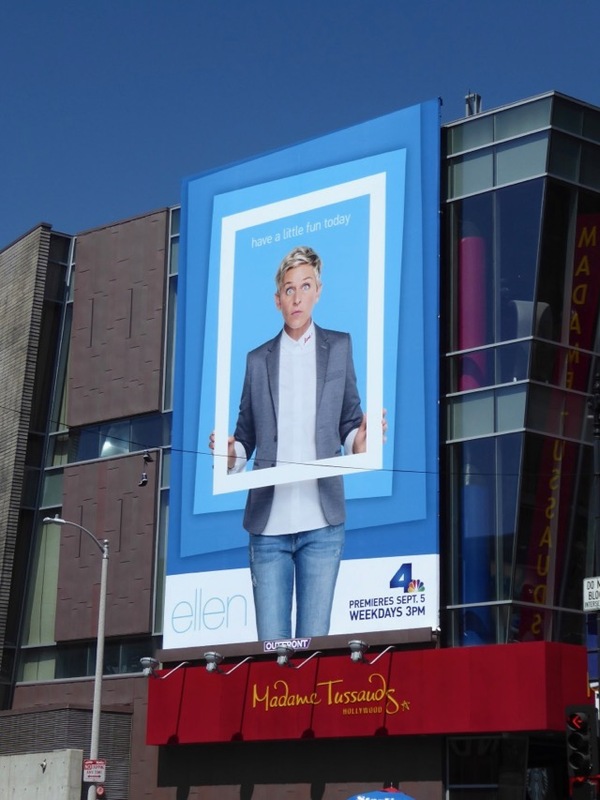 UPDATED: By the looks of things Ellen is still having fun for her fifteenth season with this billboard snapped along Hollywood Boulevard on August 14, 2017. 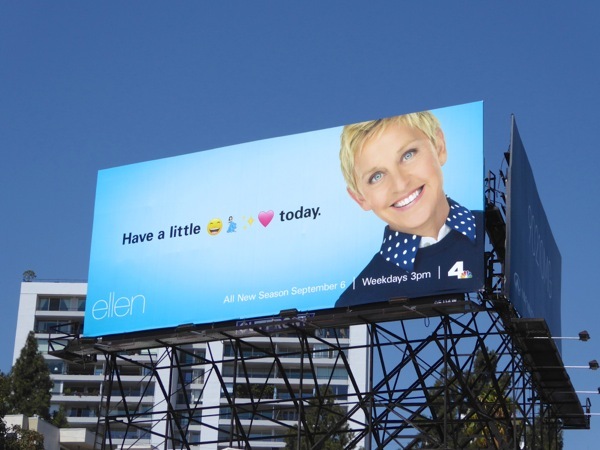 Here's also another smaller season fifteen billboard spotted above Highland Avenue on August 28, 2017. 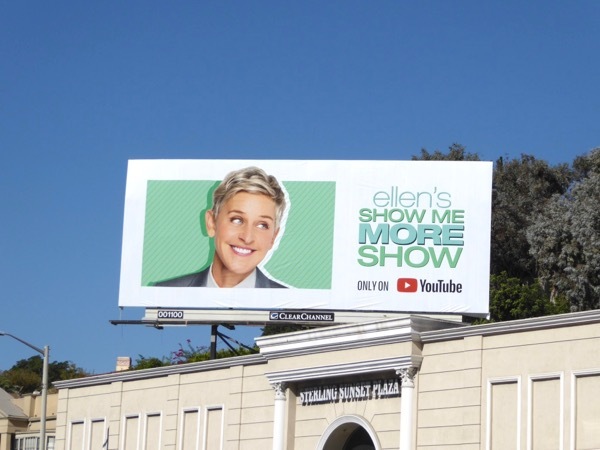 In addition this giant-sized billboard and standard landscape billboard were photographed along West Hollywood's Sunset Strip on September 21, 2017, for Ellen's new Show Me More Show on YouTube. 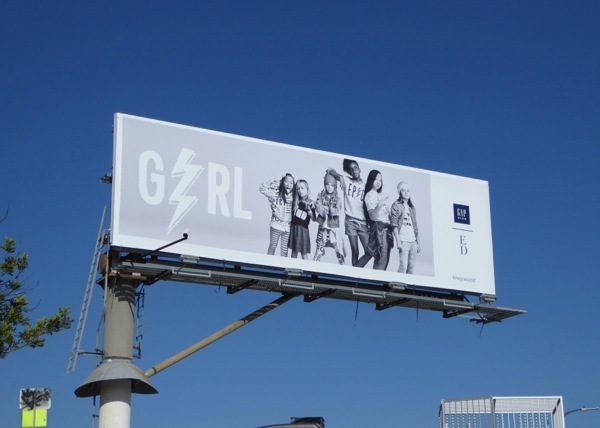 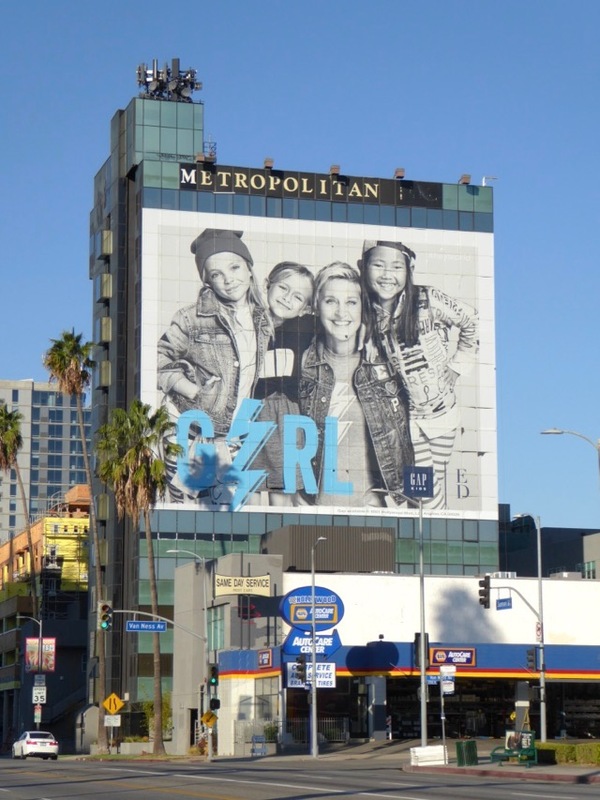 UPDATED: Here's also a giant-sized billboard for her Gap clothing collaboration spotted along Sunset Boulevard on November 28, 2015. 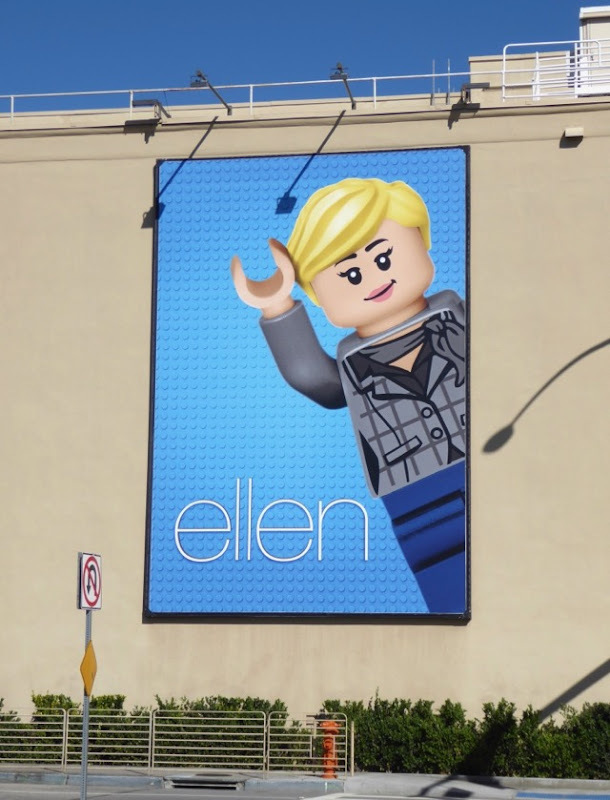 Ellen also got turned to Lego as a PR stunt for the The Lego Batman Movie and this billboard was spotted at Warner Bros. Studios on February 12, 2017, and be sure to check out the other TV shows turned to Lego. 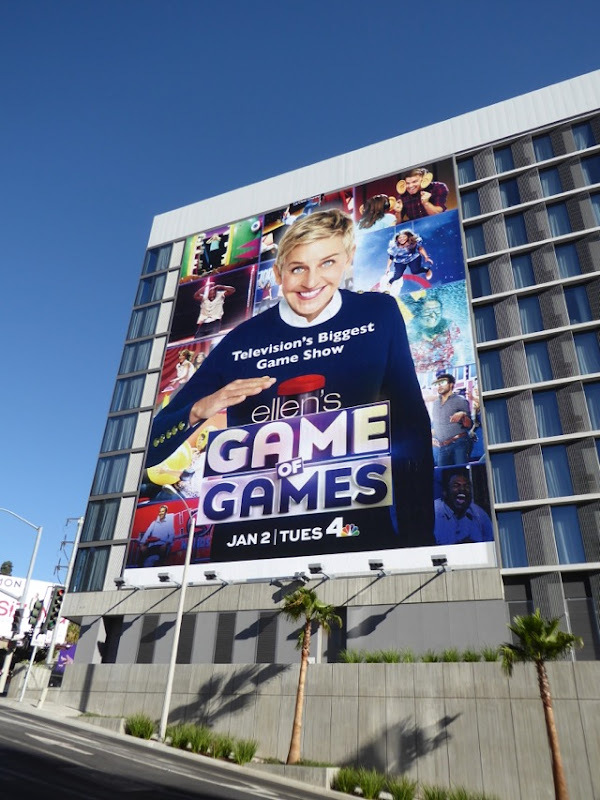 And not happy with her daily weekday talk show, the funny lady decided to host her own Game of Games gameshow, launching it with this super-sized billboard along the Sunset Strip on December 21, 2017. 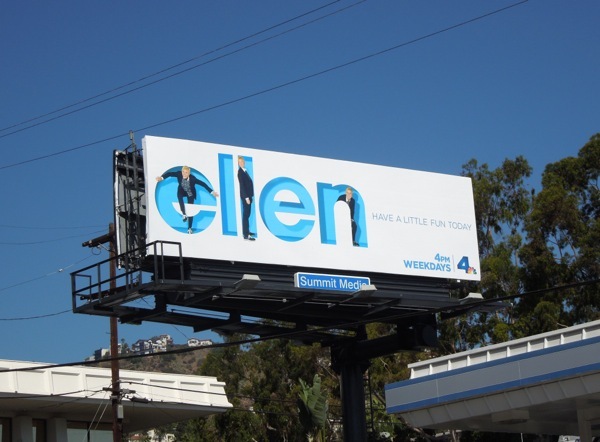 Meanwhile Ellen's talk show is back for a sixteenth season and once again bringing a lot of fun and heart with her. 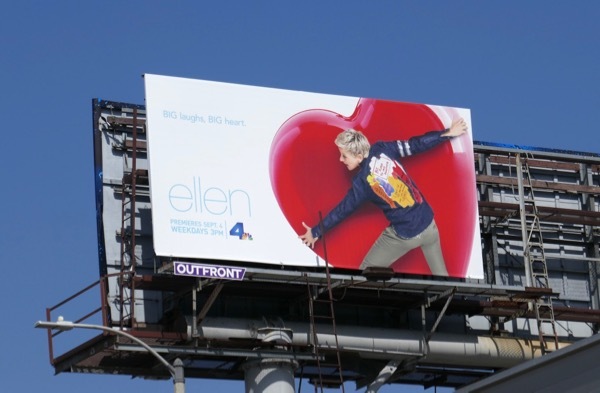 These big-hearted season sixteen billboards were spotted along Pico Boulevard and Sunset Boulevard from August 19 to August 22, 2018. UPDATED: Here's also a portrait version of the season sixteen ad spotted at Warner Bros. Studios on October 12, 2018.